A very trendy and unusual decoration solution would be to equip your kitchen with high gloss furniture. This is a perfect addition to a home that already features some of the glossy decoration elements. And, it looks astonishing in sunlit kitchens. 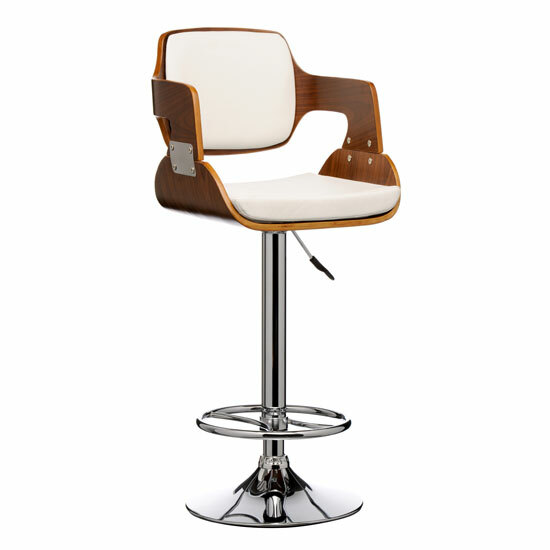 Another great example of trendy kitchen furniture would be to equip the room with a bar stand. Not only this is a very stylish, but also an incredibly functional decoration solution. The choice of matching furniture in this decoration pattern will mostly depend on the bar stools you choose. One of the most memorable and eye-catching solutions would be to go with glossy ABS chairs that can come practically in any color. If you would like to follow the latest interior decoration trends, stick to genuine wood. This is a classic decoration solution for any kitchen, which is gaining back its popularity these days. Plus, you have a chance to express your individuality, as there are so many different wood types and shades to choose from. If you have big windows and your home features very modern interior scheme, you might want to consider plenty of glass and chrome elements in your kitchen. Plus, both glass and chrome are much easier to clean than wood or MDF, which makes them perfect materials for any given kitchen. Another incredibly stylish solution you might want to give some thought to is rustic furniture. Think, for example, of a stylish chunky oak table and a couple of matching benches; perhaps, a bit bulky storage cabinets made of the same material – all of those will look gorgeous in spacious kitchens. And, of course, it is possible to go with vintage style – you just have to define which one: white French cottage, mahogany Victorian, etc. If you are looking for a store that can offer you a vast selection of trendy kitchen furniture, you should start your search at big retail chains rather than at small ones. In the UK, a nice example of a big store that can prove useful is Furniture in Fashion . This local company focuses on stylish, contemporary solutions, and offers its products at a highly affordable cost. In addition, you can always visit company showroom in Farnworth if you would like to personally examine the piece before buying.